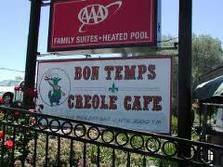 An electrical fire filled the Bon Temps Creole Cafe in San Luis Obispo with smoke early Tuesday morning causing extensive damage. Fire Marshal Rodger Maggio said the fire appears to have started in the cashiers station were a group of wires were pinched together and covered with combustible material. Fire damage was contained to the cashier’s station, however, there is significant smoke damage throughout the building. The fire was reported at 3:50 a.m. by a passerby who saw smoke coming from the roof of the restaurant at 100 Olive Street about a block from Santa Rosa Street. The popular Cajun eatery is expected to be closed for some time. I hope they’re back in business soon. Love their food and the people are great! And, hate to say it, but a deep cleaning will do them good! I hope they take advantage of the down time to spruce up the place a little. I have never been there because it looks so dingy. Don’t let the “character” of the place fool you. Phil is a top-notch chef and the food is really good. Some of the best food can be found in dingy little restaurants, especially for this kind of food. NuttyBuddy is right, the food can’t be beat, the service is wonderfully friendly, and the prices are good. Hope they are back in business soon, and I don’t care HOW they look.